All Day Breakfast at The Archive? Why Not! "The Archive’s mission is to provide a platform to promote a diverse and active cultural community, nurture a new generation into literature and education while at the same time, create a space of exploration and entertainment." The Archive is one of those unique spaces in Dubai that focuses more on the holistic side of living. Surrounded by books focused on the Arab arts and literature, it provides a non-commercial space for people to enrich their mind, body and souls. With a warm and inviting atmosphere and surrounded by greenery, no wonder we spent half the day there, we found no reason to leave! With it's picturesque location in the middle of Safa Park, this cultural/art forum also serves up an all day breakfast menu. I am a firm believe in quality over quantity, and you could say the same about this menu. With just a few items ranging from omletes to french toast and even eggs benedict, this staple brekkie menu has developed a solid reputation in the F&B world. We were a group of four, and each decided to order some variation of eggs, however we couldn't resist the temptation of the French toast. So in addition to our individual breakfast items, we opted for an order of this sweet treat to share as our happy ending. Served with a fresh berry compote and Chantilly cream, heavenly was the only word that came to mind when we tucked into this popular dish. All of the dishes were served in a hearty portion size, and were aesthetically pleasing. They used the freshest of ingredients and seasoned everything well to the point where each plate was wiped clean. My eggs pictured below were covered in a rich hollandaise sauce along with the crunchy asparagus and sauteed spinach, the citrus undertones and creaminess of the yolk and sauce all melded beautifully together. To accompany any good breakfast item, you always need a string cup a joe, which they have also done creatively at The Archive. Serving the steamed milk alongside a carafe of espresso, you get the perfect pour every time. Not only is attention paid to the fine details, but because of the unique presentation and excellent quality of the coffee, it's what makes a simple latte so memorable. After a 16 day long celebration of food and feasting, Gourmet Abu Dhabi 2013 finally came to an end and had to do it in style with an elegant soiree complete with a 5 course menu and canapes galore! The lobby filled with familiar faces of event attendees along side media personalities who shared one common love, food. People dressed in their very best enjoyed the hors D'oeuvres as they streamed out of the kitchen. It was such a busy meet and greet, I wasn't able to capture images of all the beautiful treats prepared by the high-end kitchens of the St. Regis Hotel, Saadiyat Island, until we sat down for our perfect meal. I did manage to grab at least one of the items, a Thai inspiration, fused with lemongrass and ginger, these flavorful prawns were a burst of asian essence and prepared us for the multi-course menu that awaited us. As the evening rolled on, we were invited to take our seats at the dinner table. Lucky for us, we had a fun group consisting of a top chef friend from Dubai, the Valrhona chocolate representatives, and the purveyors of some of the finest products in town that go by the company name Chef!!! We familiarized ourselves with our surroundings and as the music played lightly in the background, we checked out the menu we were about to indulge in, I could already tell the evening was going to get better. Our first course was created by Chef Wafaei Al Zaham of the Yas Viceroy in Abu Dhabi. Chef Wafaei won the Regional Cuisine Restaurant of the Year 2012, and earned his place at the dinner table this evening. This timbale of crab, gulf shrimp, and shanklish sat on top of waves of beetroot and zaatar dusted crispy vermicelli. Scented with spearmint and orange, this dish was light and airy and delicately eased us into the meal.I really enjoyed chefs creativity in melding these flavors together as well as in his presentation. The dish was eye catching and balanced with a great use of textures. For our second course, we enjoyed a dish prepared by guest chef Chumpol Jangprai, the Siam King's Lobster Dumpling with a spicy "tom yam" bisque emulsion and rice cracker caviar. A refined take on some classic Thai flavors. Because these dumplings were freshly made, the taste and consistency of the dough was perfect, and you really can't go wrong with a lobster filling, any way you cook it! The sauce was a milder version of a familiar thai soup, I just wished the spices had been kicked up a notch, because it felt like something was missing from it. Perhaps the chef was trying to accommodate a different palate, but to me thai food should have a little more heat. Our next course was by Chef Frank Camorra, a steamed black cod with smoked rice caldoso, sea urchin, and sea vegetables. 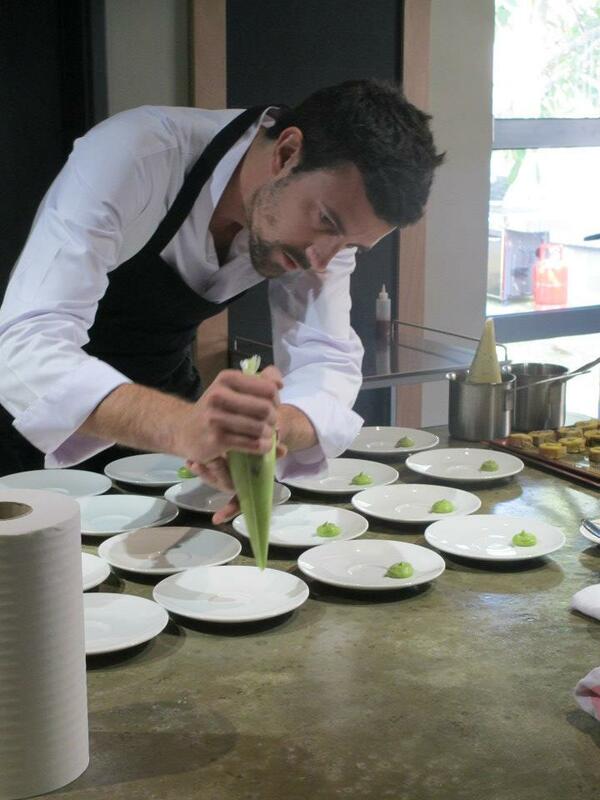 Frank is a native from Barcelona, but his cuisine is well known through out the culinary world, especially in the Land Down Under where he has six different operations under his belt. This particular dish takes inspiration from the ocean, and executes fine technique as well as a harmony of flavors that really make one feel as if they are enjoying this right by the open sea. The creamy smokey rice complemented the salty sea vegetables and the crunchy sea asparagus added that extra element of flavor that made this dish stand out. The sear on top of the black cod was done to a crispy perfection, seasoned and cooked well, this had to be the most memorable dish of the evening! The final course before dessert was by chef Patrick Bischoff, winner of Gourmet Abu Dhabi 'Executive Chef of the Year 2012'. He is currently based at the Beach Rotana in the heart of Abu Dhabi. I had the pleasure of presenting with chef Patrick at the Culinary Creation stage a couple weeks prior, and he demonstrated this dish for the audience in a couple of quick and easy steps, a milk fed veal medallion, "souvaroff" style with winter truffle jus, carrot mousseline and straw potatoes. Talked about a packed dish, this one had it all, including a hidden piece of foie gras lying under the duxelles of mushroom and truffle. Chef Patrick is one of the nicest and professional chefs I have met in the UAE, and really takes a lot of pride with his work. He runs a stand-up operation, and I can personally vouch for that, since I have always had a wonderful experience at many of the venues in his hotel, Finz being at the top of that list. The final course of the evening was by chef Christophe Sapy from the St. Regis Saadiyat Island. He teamed up with Valrhona to prepare this extremely playful chocolate dessert. At first glance this plate brought back childhood memories with Hershey kiss like mounds and little chocolate covered bon bons on top of what looked like "chocolate dirt", it felt like a scene from Willey Wonka's Chocolate Factory! However this creation was anything but childlike, the nyangbo chocolate cream made from 68% pure Ghana dark chocolate filled with roasted peanut ice cream were a cool and creamy treat. The meringue drop and guanaja and peanut crumble gave it that crunchiness that melded so harmoniously with the dulcey liquid sphere. 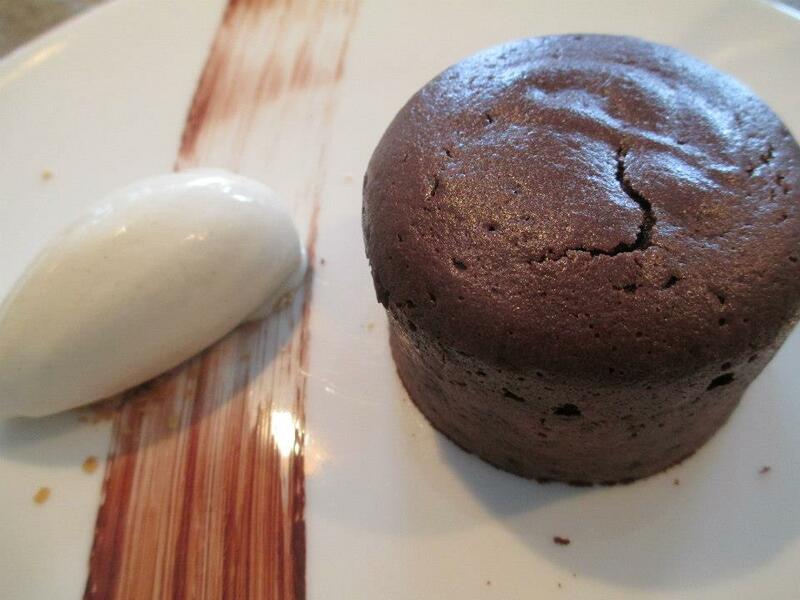 Chef Christophe and Valrhona make a good team, and this dessert was a clear example of that, kudos to both! And with that Gourmet Abu Dhabi 2013 comes to an end, an action packed fun filled food fest that did the city proud. It was a great experience, and I only wish it could happen every day of the year, but somehow, I don't think my waistline would approve. Looking forward to more of these gastronomical wonders when Gourmet Abu Dhabi comes back around next year! Dinner at Cavalli Club and More! There are some places in Dubai you put on the top of your list for great food, there are some that are purely glitz and glam, well wouldn't you know that Cavalli club at the Fairmont in Dubai serves up some interesting fare along side some entertainment that is unique to this landmark venue. I have been living in Dubai for almost 2 1/2 years and had never had a meal at Cavalli Club, but on this particular evening, I didn't realize I came in for the ultimate dining experience! Cavalli Club is know to be a unique venue, hosting some of the swankiest events in town. On this particular evening as my guest and I sat down for our meal, were welcomed by an unexpected surprise! Cavalli Club just so happened to be hosting Dubai's Next Top Model Search (Male edition), and we had front row seats to the action. What more could two single girls ask for!? They even created a special menu for the night consisting of four different courses showing the best of the best they could offer for an event of this magnitude. Our first course was the Pate di Vitello con crostino di pane toscana/Veal Tenderloin pate on Tuscan croutons. Now Veal pate was a first for me, and I would have to say it's some what of an acquired taste. Although the texture was exactly as a pate should be, I myself am not particularly fond of this delicacy. It was a generous serving and well seasoned, the touch of bruschetta complimented the meat mixture and brought out some of the sweeter undertones. Next up was the Fagottino ai gamberoni con salsa al basilico/King prawn bundle with light basil sauce. This dish was an unexpected explosion of flavors. The bundle itself resembled a crepe, soft on the bottom and crispy on top. The filling of succulent prawns, basil, and medley of crunchy vegetables made for a fantastic combination of flavors. The basil sauce lining the bottom of the plate brought everything together, and I'm glad there was a lot of it, because I was ready to lick that plate clean. Our last course was Filetto di sogliola farcito all'astice su letto di spinace/Lobster wrapped with Dover sole served with spinach reminded me of a galantine style of preparation. The Dover sole was de-boned, stuffed with lobster, and poached in this cylindrical shape, most often found in French cuisine. This dish was elegantly prepared using classic technique, but could have used a touch more seasoning as well as sauce to really brighten up the natural flavors of the quality seafood used in the preparation. Being part of the culinary media world can really be a treat sometimes, and after our first three courses we eagerly awaited our desserts, but apparently Zaib Shadani and I spoke too soon. The organizer of the Dubai's Next Top Model Search is an acquaintance from the industry, and she approached me frantically, informing me the third judge canceled on them last minute. She asked me if I could stand in as a judge for this round, and I politely accepted. Before we knew it we were swept onto the stage and admired the handsome young eye candy that walked past. I guess you could say, we had our desserts after all! 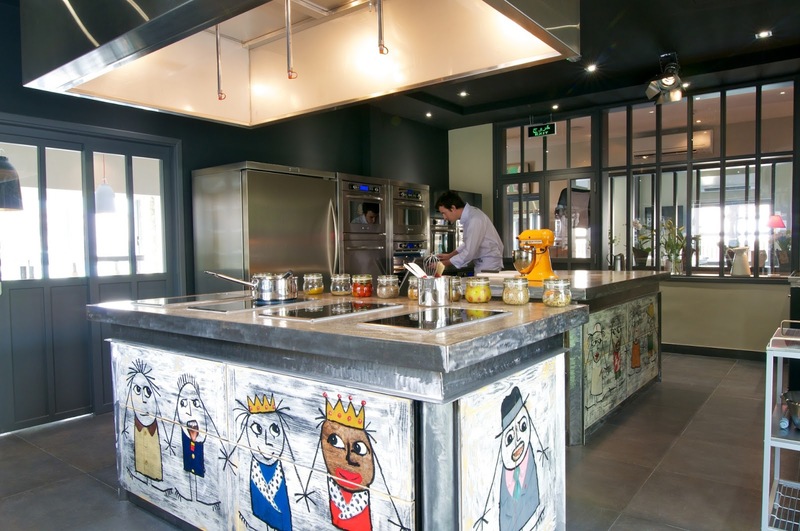 Located in Jumeirah 1, conveniently on Beach Road neighboring the Biker Cafe, is Top Chef Cooking Studio. 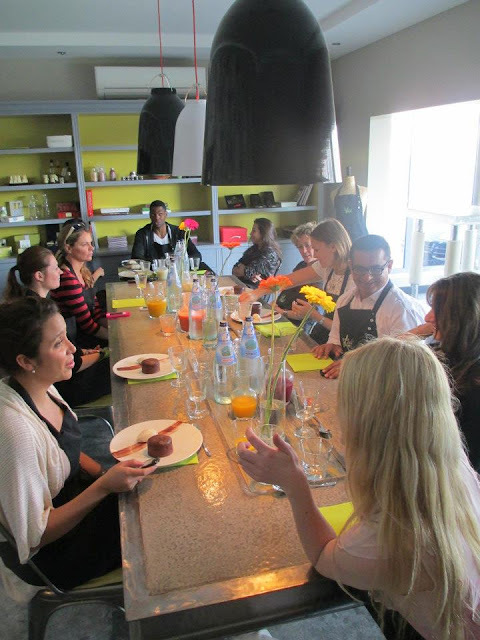 They offer cooking classes for adults & children, private culinary events & birthday parties as well as corporate team events. Not only is the gorgeous venue aesthetically pleasing to the eye, but it is equipped with state of the art facilities and is decorated with the utmost attention to detail, including unique finishings and quirky interior touches. Everything is designed to create a high quality and intimate setting that will turn every event into a memorable experience. French Chef Hadrien Villedieu, is a character indeed, his sense of humor and passionate "french" ways make the experience even more interesting. He graduated from the Ecole Superieure de Cuisine Francaise, and trained with renowned Chefs such as Joel Robuchon, Jean-Pierre Vigato and Alain Passard. He really takes the lead during his workshops and teaches professional techniques during the interactive sessions. 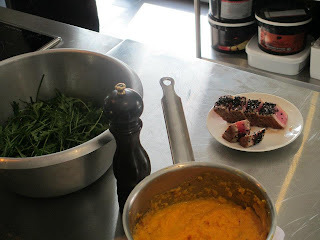 On this particular afternoon we were invited in to learn a quick, easy, and delicious recipe created by Chef Hadrien just for the event. 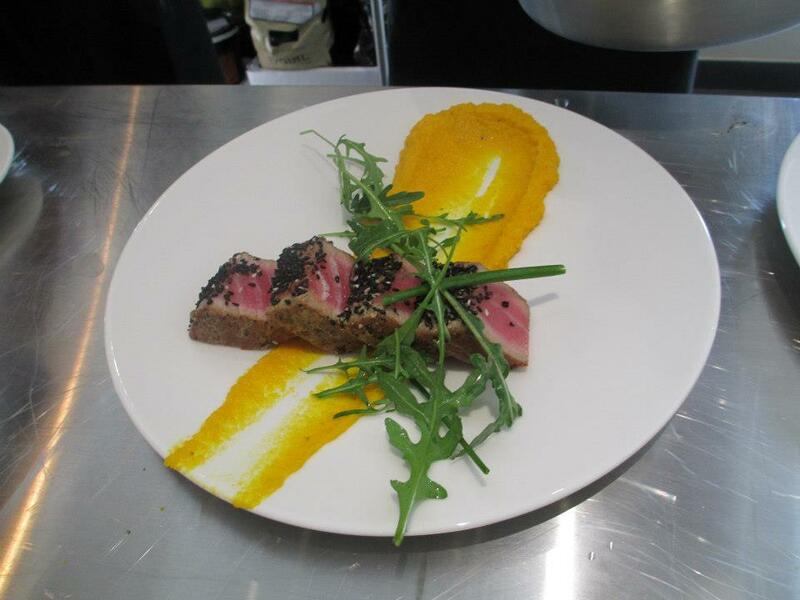 It was a Pan Fried Tuna Steak crusted with Black and White Sesame Seeds paired with a Carrot and Orange Puree, and finished with an Orange infused Argon oil and Rocket. It was just a couple of simple steps, which got our whole group involved, and resulted in an excellent team building exercise. 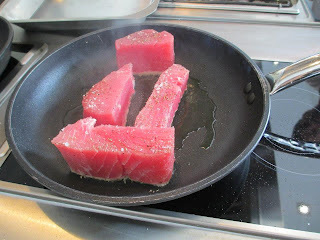 We were in groups of six, and each given a station to work with, from pealing the carrots to slicing the tuna steak, Chef made sure we all played a part in the construction of our soon to be lunch. Every part of the preparation was methodically planned, and well executed. 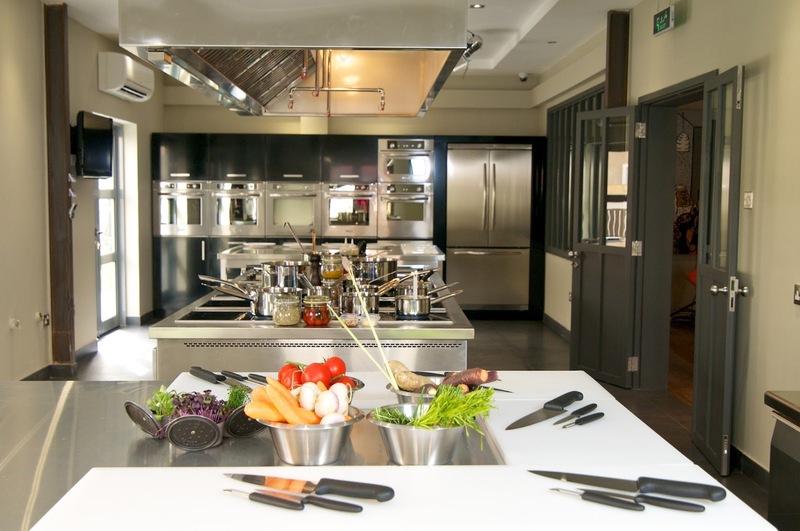 The Top Chef Cooking School have the formula for not only a successful event, but a great way to learn and share those memorable experiences with friends or even make new ones! My friend Layne and I in action here, slicing up the perfectly seared tuna, against the grain as Chef Hadrien so elegantly taught us. Pretty much every chef I know is a fan of the "smear". 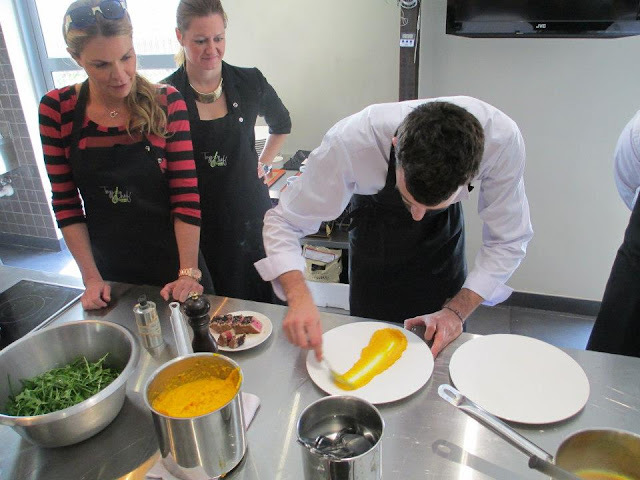 This technique requires an artistic twist of the wrist to create an elongated display of the sauce or puree on the display dish. It takes the plating from a simple home-made creation to professional one in a clean swoop. Since we have moved on to the plating, it meant we were getting closer to enjoying this delicious meal. Not only were the colors bright, but the aroma and energy in the cooking studio brought smiles and cheer to everyone's faces as we enjoyed learning the step by step process to creating this culinary masterpiece. The final dish! We thoroughly enjoyed the artistic and straightforward approach at the design and execution of this meal. Chef Hadrien and his team at Top Chef Cooking School not only put on a thoroughly enjoyable show, but create a magical environment from which you can actually absorb and retain all this foodie knowledge to share with your friends and loved ones. Of course Chef Hadrien is an advocate of all things French, and we could not have a meal without enjoying a delicious Valrhona chocolate dessert! 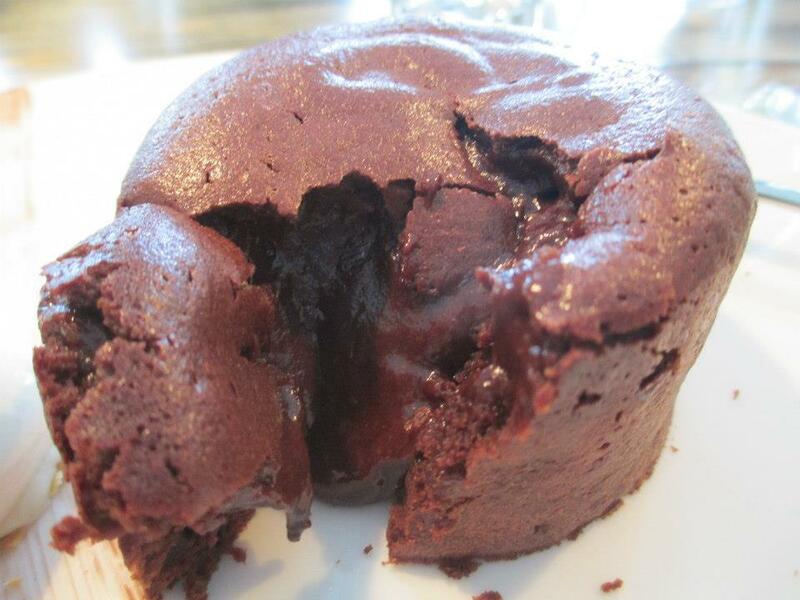 Valrhona chocolate is a product well known to chocolate lovers and chefs all over the world. Most chefs prefer to use this high grade product as it elevates the taste of your average dessert to the next level. Using some very basic ingredients, paired with this gourmet delicacy we were able to enjoy a restaurant quality chocolate fondant made by our own hands! The Fondant cooked for just under ten minutes, and we were given a top tip from Chef Hadrien on how to achieve that melty chocolate center. Wouldn't you know, he actually bakes the cake with 3 whole Valrohona Chocolate disks, which alters the cooking temperature in the center of the cake and gives you that velvety texture you desire from this ever popular dessert. In true french country fashion, we all sat down to enjoy our meal family style. We plated our own dishes in the kitchen and made our way to the long banquet table set with fresh juices, waters, and bread. It was the perfect end to a perfect day, and we cooked, laughed, ate, and enjoyed a well rounded experience at this one of a kind venue. This is a great way to pass time if your looking for alternatives to an evening out or an afternoon of friendly bonding. After all, they do say preparing a meal is a labor of love, so why not share the love at a Top Chef Cooking Class. Asado at the Palace hotel is one of my favorite restaurants in Dubai. I can honestly say that I have never had a bad meal there, and every experience I have had there, keeps outdoing the last. This past tasting was no different. Chef Norberto has pulled out all the stops to make sure his menu at Taste of Dubai 2013 will give event attendees a top notch experience even outside of the restaurant. Chef Norberto has over 11 years of experience under his belt, he completed his management studies in the UK, and worked in kitchens all over South America. We started the evening off with a Quinoa salad, a quintessential ingredient originating from South America. I was introduced to this super food a few years back, and haven't stopped eating it since. Aside from it being healthy, it has a nutty taste, and soft yet fluffy texture which can hold up to a variety of ingredients, flavors, and textures. Chef Norberto prepared the red quinoa, which is heartier than than the white. With earthy and citrusy under tones, this was a nice start to the meal, and a perfect salad to enjoy in an outdoor setting (no knives required). Chef Norberto as well as his team were bursting with pride when presenting this item, Choripan con Salsa Criolla. The beef sausage (Chorizo) is made in-house and paired with the onion relish (Salsa Criolla) which makes for the perfect outdoor festival food. The crusty bread used to make this sandwich brought all these elements together for me, no wonder people all over Buenos Aires line up street side for these tasty little treats. Argentinian food is synonymous with great steak, and that is where Asado always delivers. Pictured below is the Bife Angosto con Ensalada Mixta, a slow cooked Argentinean Sirloin with a mixed salad. For me, the best part about an Argentinian restaurant is the accompaniments, and Asado is known to have some good ones, including a wide array of mustards, sea salts, and sauces. I think this cut of meat could be paired with a nice chimichurri or salsa to give it an added burst of flavor which exemplifies an Argentinian style steak. . If anyone has had the pleasure to enjoy the Cabrito Asado con Papa Morada de los Andes, then you know it's quite a spectacle to see. Roasted whole on a spit, time and meticulous effort is taken into cooking this baby goat to perfection. Paired with some pickled peppers and purple potatoes this is one of Asado's signature dishes. The last course was a nice surprise, it's everything you expect from an Argentinean style dessert, but done with the Asado twist. Pictured below is a home-made Malbec and Dulce de Leche Ice Cream served in a glass sitting on a cloud of dry ice. The medley of flavors ranging from the tart of the Malbec to the creamy sweetness of the dulce de leche was unlikely, but came together rather nicely. I have to add, they really do have a knack for presentation at this fantastic restaurant in downtown Dubai at the The Palace hotel. This was the last dish of the evening, and I'm so glad it was! Flan De Dulce de Leche brings together the richness of a custard and the round, warm, toffee flavor of the "candy milk" essence which were all beautifully balanced. This is one dessert I didn't leave behind, even after eating so many courses, I could not let this pass me by. I finally found the best rendition of this dish in town! With Taste of Dubai 2013 ( http://www.tasteofdubaifestival.com/) just around the corner, prepare your appetites for a 3 day food feast. 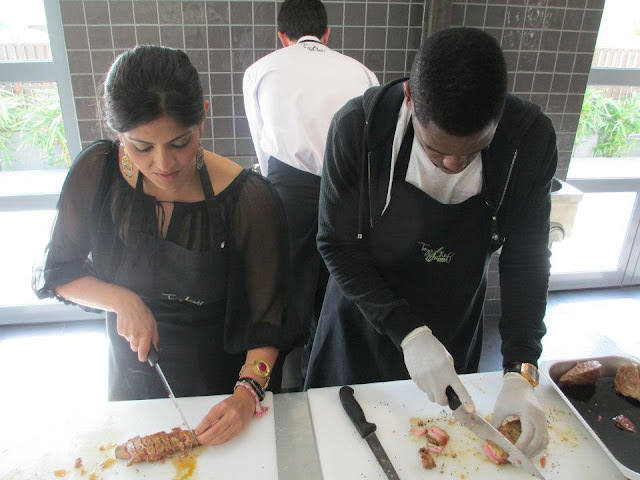 Make sure you start training now, so you are able to enjoy all the gastronomical wonders that await! Asado is one restaurant you must try whether it's at Taste of Dubai or at your next visit to The Palace hotel. Although, the marketing Manager did inform me they have some surprises which they will unveil at the event, I can't wait to see what they have in store for us. The Palace hotel conjures up images of elegance and prestige, and that's exactly what you get at Thiptara Thai restaurant in downtown Dubai. Serving up authentic Thai cuisine in a gorgeous locale surrounded by the Burj fountains, this is a one of a kind venue which makes for a special evening out. We are lucky to have Thiptara participating at Taste of Dubai 2013, this is the first year The Palace has gotten involved with this culinary event, and after this preview tasting, I think we are in for a treat. 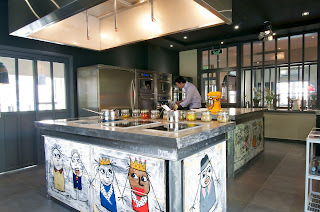 Chef Chaiwat Kawikitpraphat has over 15 years of experience in his field, he brings unique insights to Thai gastronomy. First to arrive at the table is the Yum Som-O also known as a Pomelo salad. This crunchy, sweet, sour, and creamy combination of flavors is the reason I fell in love with Thai cuisine. Chef Chaiwat has a knack for combining a lot of texture into his dishes and the first to introduce that combination was this siganture salad. It's refreshing and balanced, and had just the right amount of heat. This dish will do well at the festival as it's perfect for the weather and atmosphere. Our second starter was just as flavorful as the first. Building on more intensity of flavor, this dish brought another dimension of Thai cooking to the table. The Thod Maan Goong or prawn cake, with the pungent taste of lemongrass infusing the delicate and juicy flavor of the shrimp, was the perfect portion size (although I wanted more). Playing with texture again, Chef made sure that this dish incorporated plenty of that crunch factor! Lastly is the Geang Kiew Wan Gai or more commonly known as Thai Green Curry with chicken. Complete with the Thai and baby eggplants, the subtlety of this dish is what I really enjoyed. When a chef can capture the essence of a good green curry including the notes of Kaffir lime, coriander, coconut cream, and chilli without going to heavy on the spice, then you know it's a good dish. The baby eggplants add that special burst of flavor which makes this dish authentic. We did enjoy a couple of dessert tasting, one of which was the Tab Tim Grob and the Sang kha ya (pictured below). Now I am not usually a fan of asian style desserts, but there was something very comforting about this Thai custard cake. The tendrils of sweetened fried egg yolk on top of this rich dessert gave it an unusual taste, but one that was also pleasantly surprising! All of these dishes will be available at Taste of Dubai 2013 on from March 14th-16th (http://www.tasteofdubaifestival.com/). Look for The Palace hotel stall, and there you will find Thiptara's elegant fare along with their friendly and knowledgeable staff. All menu items will be priced between AED15-AED 30. Make sure you put this restaurant on the list of places to check out, it's definitely worth the trip! It has been a non-stop food frenzy over in this part of the world. With Taste of Dubai (TOD) just around the corner, we had the pleasure of being invited to preview a taste of the goodies set to be shared at the three day festival this coming March. The first of these tasting series was at Carluccio's Dubai Mall. Now, Carluccio's is no stranger to TOD, but they expect to see a lot more foot traffic this time with the popularity of this event growing year after year. The menu featured here are the exact items available at the festival, and in the same generous serving size! Chef Alessandro put his heart and soul into these dishes and has created the perfect menu to represent the country of his origin. Pictured below are the famous Carluccio's Arancini. These morsels of goodness are deep fried saffron flavored risotto balls filled with melted mozzarella cheese. Served with a side of marinara sauce these Sicilian style antipasti are a delicious way to whet the appetite for the other treats to come. If you like extra sauce like me, don't be afraid to ask for more! Next up for the Secondi we have here the Risotto al Limone con Pollo, a lovely light and flavorful signature Carluccio's dish, that is just enough to leave you wanting more. The chicken is marinated in lemon, rosemary, and olive oil which gives it that extra dimension of flavor. The Risotto is cooked al dente, which is the true Italian way! Chef Alessandro takes his cuisine very seriously and it is evident with this perfect presentation of an Italian original. Since this was a tasting, we were able to enjoy yet another Carluccio's favorite, the Penne Giardiniera. Apparently this dish was created on the spot in the kitchens at one of Carluccio's first restaurants at the Market Place in London. Antonio quickly came up with this recipe to feed a hungry vegetarian customer. It has since become a key dish and also helps to raise thousands of pounds for children in Liberia, with money being donated to Action Against Hunger for every dish sold. This dish has to be one of my personal favorites, the crunchy and wholesome taste of the spinach balls contrasting with the creamy pasta is comforting and balanced. Available on the dessert menu are the Panna Vanilla pictured below as well as a selection of Gelati including chocolate, strawberry, vanilla, and lemon sorbet. The panna cotta's consistency was silky and smooth, lemon and vanilla flavored cream with a raspberry coulis and fresh raspberries is a harmony of sweet and tart which makes for a tasty dessert! If you're like me and plan your meals for days and weeks to come, make sure you work Carluccio's into that schedule. The restaurant itself has a couple of outlets in Dubai including Dubai Mall, Marina Mall, and Mirdiff City Center. However if you are planning on attending Taste of Dubai 2013, (http://www.tasteofdubaifestival.com/) then put this eatery on that list. With items ranging from Aed 15-Aed 20, you are getting excellent value for money at this quality establishment. Pictured here we have a rondo roccoso (rock of the sea) and a bronzed tomato and sweet prawn ceviche. This was the most innovative dish in my opinion, gorgeous lobster medallions and avocado rolled lobster salad with a tomato "popcorn" made using liquid nitrogen. Chef Michel Sarran is a Michelin star masterchef and an emblem of Toloussian gastronomy. His culinary journey started at home at his mother’s restaurant. His cuisine is described as a “Respect for the original with innovative touches” Chef Sarran has cooked for important people all over the world, but his most memorable experience was when he cooked for Nelson Mandela. 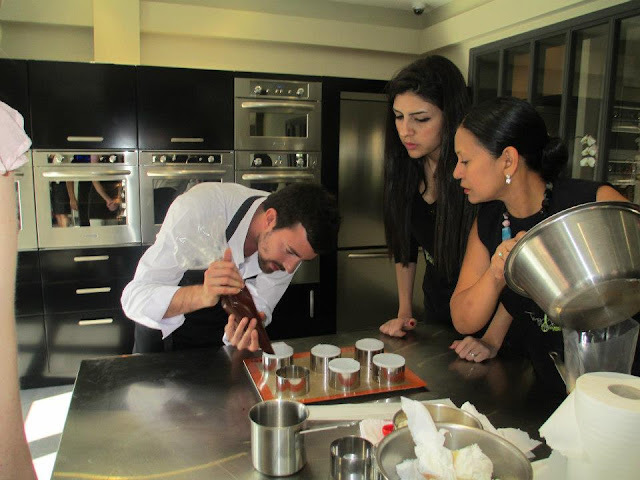 Chef Mauro is also an ambassador for Nespresso, and with this high end coffee product he created this fusion of flavors. Coffee marinated scallops, corn puree, and polenta chips with wild sorrel sprouts, a delicious work of art! "Passionate about pastry" is Ernst Knam's motto, the German chef currently works at the Hyatt Capital Gate in Abu Dhabi. He has worked all over Europe before he landed in Milan to really begin his career. He has written eight publications and participated in many competitions including the Toque d’Ore in Lucerna (2 wins in pastry / 1 in kitchen). In 1996 he opened “La Nuova del Arte Catering” in Milan, where he offers classic and imaginative cuisine. Chef Gianluca Fusto is a master pastry chef. He was born in Milan and is a lover of cocoa His desserts are viewed as the latest experiments of contemporary art. He is currently consulting and offering tailor made courses all around the world. Chef Gianluca is an ambassador for Valrohna chocolates, the finest french chocolate used by great chefs from all over the world. He was named Best Italian Pastry Chef 2012 at Milan’s Identita Golose International Congress. Pictured Below if Chef Gianluca's Creation. Roberto (Bobo) is the little brother, who looks up to his elder brother Enrico. He has passion for good food, and it's clear when he speaks in such intimate detail about the dish. He studied and practiced for many years to perfect his technique. His culinary roots are based in the finest traditions of Mediterranean cuisine. Chef Roberto's demonstrated a foie gras risotto, complete with prawn bisque, marsala reduction, and panko crusted prawns, it's a work of art and equally as tasty. The foi spheres seemed to just melt into the warm creamy risotto, and the balance of sweet, salty and savory made for a one of a kind dish! Rachel Allen is a Dublin native TV chef, author, journalist, and mother. She attended and now teaches at the Ballymaloe culinary school, located in Ireland on a 100 acre organic farm. She has a practical cooking style, which is simple and delicious for family and friends Rachel cooks with regional and global influences, and is just the loveliest person all around! Rachel demonstrated Irish soda bread, quick, easy, and (smothered with butter) were oh so delicious! Chef Philippe Etchebest is a French Michelin starred chef. He was awarded “Best French chef” in 2000, that then earned him 2 Michelin stars in 2008 for Hostelliere de Plaisance in Saint Emillion France. Known for inventive, creative, and amusing dishes. His seasonal cuisine is reminiscent of French traditions with International touches. Chef Philippe is also a French television personality for the program Cauchemar en cuisin3 which has taken inspiration from Gorden Ramsey's Kitchen nightmares. Chef Philip demonstrated a gorgeous foie gras and sweet prawn ravioli which he fused with a gorgeous coconut and lemongrass broth. It was such an aromatic dish and so enticing, that I didn't get a chance to snap a photo of it. Everyone rushed to gobble it up (including myself), but at least I was able to capture the fresh ingredients he used, pictured below. Abhijit Saha is the founding director and Chef of Avant Garde Hospitality Pvt Ltd. He currently owns and operates two critically acclaimed premium restaurants in Bangalore called Caperberry and Fava. He is considered one of the '50 Most Influential Persons' of Bangalore chosen by DNA newspaper. In December 2011 he won the Jury Special Chef of the year Award at the Hotelier India Awards. Chef Abhijit is rated amongst the top 10 chefs in the country by Outlook magazine as an expert in Classical and Modern European Cuisine & Regional Indian cuisine. He is a member of the voting panel for the London based ‘Restaurant’ magazine’s annual list of 'Top 50 Restaurants of the World'. Chef Abhijit's demo included the demystifying of molecular gastronomy and its application in Indian Cuisine with two dishes. The first was a Gol Guppa Spherification with Tamarind and Spice Explosion, the second was Dhuyen Ka Murgh Korma-Smoked Chicken Curry. Both were visually stunning! The Culinary Creation Stage at Gourmet Abu Dhabi is a one of a kind experience. An all day weekend event with superstar chefs from across the globe, how could you go wrong!? For residents and visitors who attended, feasted, and learned about cooking techniques and trade secrets from these industry professionals this was an affair to remember.